From nearly the beginning of the Citus Cloud service, we’ve had an internal formation provisioned and managed by the service itself. Dogfooding in this manner brings all the usual benefits such as gaining operational knowledge, customer empathy, and etc. However, more interesting than yet another blog post going over the importance of dogfooding is the two different ways we’re using our Citus formation. Setting up a distributed table requires a bit more forethought than a normal Postgres table, because the choice of shard column has a big impact on the types of queries and joins you can do with the data. 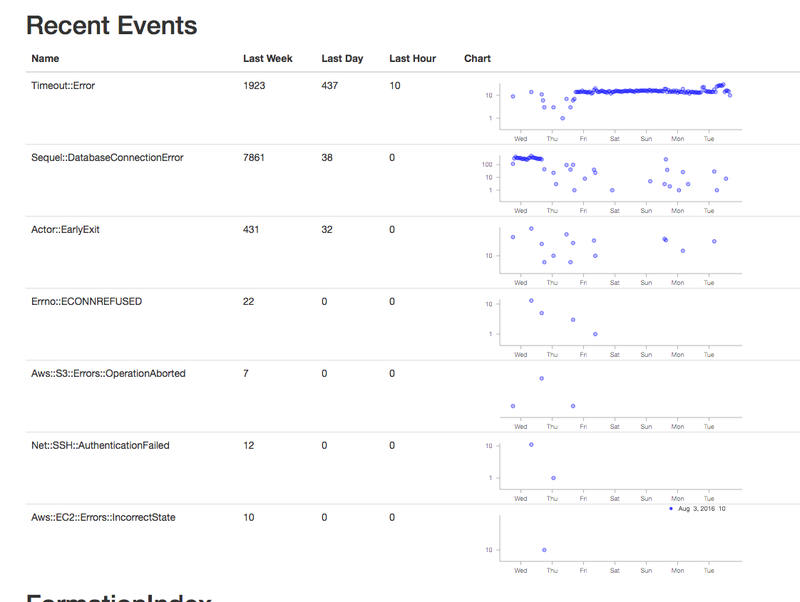 We’re going to look at two cases here: a time-series metrics table and an events table. The first is a metrics table that we fill with data from AWS Cloud Watch for all servers and volumes that we manage. We then show graphs of this both for internal and customer-facing dashboards. The table has the following structure and is sharded on server_id. The primary key is several columns wide to both serve as a unique constraint preventing duplicate data points and as an index over all the columns we query on. There are currently only two queries on this table. The first is simply inserting data after periodically fetching data from AWS CloudWatch. The other gets the data for the graphs that are shown both on the internal admin site and on the customer-facing console and looks like select … where server_id in (?,) and name in (?,) and timestamp > now()-'? hours'::interval. Because Citus shards are just normal postgres tables, this query is parallelized by going to only the shards necessary for the server_id list. Once on each shard, finding the data is very fast because the other two where conditions are covered by the primary key. The main downside to sharding on server_id is expiring old data is a little cumbersome. We have to go to each shard and run a delete … where timestamp > '?'. This can take a while depending on how big a window we’re pruning, and it leaves a bloated table that requires vacuuming. A nice alternative is to use standard time-based table partitioning for each of the shards, and then simply drop the old time tables. We haven’t done this yet because expiry hasn’t been a problem so far, but it’s nice the option is there. The other table is a general event table. We are using a hosted exception tracker to discover problems in production. However we were also sending that service unexceptional exceptions. That is, these were expected errors, such as the failure to ssh into a server that was still booting. Sometimes an increased rate of exceptions in a particular category can indicate a problem even though a normal baseline rate is okay. The id column is a randomly generated uuid and the shard key, which gives a roughly equal distribution amongst the shards as events come in. Also because Citus is just an extension on top of Postgres, we’re able to take advantage of the powerful jsonb data type with the corresponding gin index which gives us very fast lookups on arbitrary keys, and the new brin index type. This clearly shows a time period of something not quite right. Sometimes we’ve gone into psql to look at the jsonb to get details if there is a high rate of some particular error to figure out which server is causing it. That is currently a manual process, and perhaps sample json bodies could be put into the UI, but doing the work for that hasn’t been worth it yet. A more exciting project would be to use some machine learning on past time periods to automatically detect outliers. If we ever do that, I’ll be sure to put a writeup on the experience on this blog.